Perhaps it has happened to you. Ill, you take a prescribed antibiotic and you begin to feel better. But a few days later after finishing the prescription, you feel ill again. Have your germs become resistant to the antibiotic? Will the next prescription work for you? Antimicrobial Resistance (AMR) claims at least 23,000 lives annually in the United States alone, reports the Centers for Disease Control (CDC). About 25,000 Europeans succumb to AMR annually (2007 data). Antimicrobials are agents (including antibiotics) that kill or inhibit the growth of micro-organisms without harming the host, e.g. the human body. On 22 March, the Transatlantic Consumer Dialogue (TACD) Food Policy Committee hosted an event on AMR, as part of its 17th Annual Meeting in Washington DC, with participation of European Union officials and William Flynn of the US Food and Drug Administration (FDA), who moderated a panel. In January last year, TACD published a policy resolution on AMR, which was sent to and discussed with EU and U.S. officials on various occasions throughout the year. To the contrary, presenters at the TACD meeting agreed that governments must act without delay to prevent the “post antibiotic era,” i.e. when antibiotics will cease to be effective against infectious diseases. Professor Lance Price, of George Washington University, said that the CDC reported 410,000 infections that resisted one or more antibiotics in the U.S. in 2014. Particularly alarming, was the sharp increase in Antibiotic Resistant (ABR) infections in the so-called BRICS countries (Brazil, Russia, India, China and South Africa). Nina Renshaw, of the European Public Health Alliance (EPHA), said that there was a short window of 12-24 months to act before ABR became widespread in Europe. European surveys by the European Centre for Disease Prevention and Control showed a far higher incidence of ABR, and especially resistance to last resort antibiotics than it had forecast even two years ago. Governments are responding to this crisis, but with mixed results. Agnieszka Jarmula of the EU Delegation in Washington pointed out that the EU banned all antibiotic use in animals for growth promotion in 2006. The EU is considering action to ban use for disease prevention but that has not yet moved forward. Jarmula outlined the EU’s Action Plan on AMR, which had value in stimulating actions within Member States and strengthening cooperation. She did not discuss individual EU member state initiatives under the Action Plan but did allow that funding limitations resulted in varying levels of implementation among EU member states. Cameron Harsh, of the Center for Food Safety (CFS) and the U.S. co-author of the TACD AMR resolution, said said the CDC, but not the FDA, has set targets for reducing antibiotic use. The FDA’s voluntary Guidance to Industry required drug companies to stop selling antibiotics for growth promotion in food animals, but allows sales for purposes of disease prevention with a veterinarian’s supervision. The TACD resolution recommends that all uses of antibiotics in animals be prohibited, except for treatment of sick animals. Consumers are increasingly demanding meat from animals raised without antibiotics, Harsh said. A baseline of action by the government could verify the currently unverified claims by meat producers and restaurants to serve “No Antibiotics” meat. Some consumers are beginning to call for a total ban on animal use of “antibiotics of last resort” like colistin, which doctors use when all else fails. The Codex Alimentarius Commission Task Force on Antimicrobial Resistance is starting to revise the Codex Code of Practice on reducing AMR, and to develop guidance for member governments on how antibiotics may be used. Codex will also address the integrated surveillance of antimicrobial use in animal agriculture and in horticulture. In addition to use in food animals, antibiotics are increasingly being used as pesticides to control plant diseases, such as citrus greening. Michael Hansen of Consumers Union (CU), who represented Consumers International at a Task Force pre-meeting, explained the Code of Practice will outline the responsibilities of every actor from Farm to Fork in the prevention of AMR. The surveillance guidance will outline methods to measure AMR levels and types towards helping governments to quantify the specific antimicrobials in use on a per species basis. 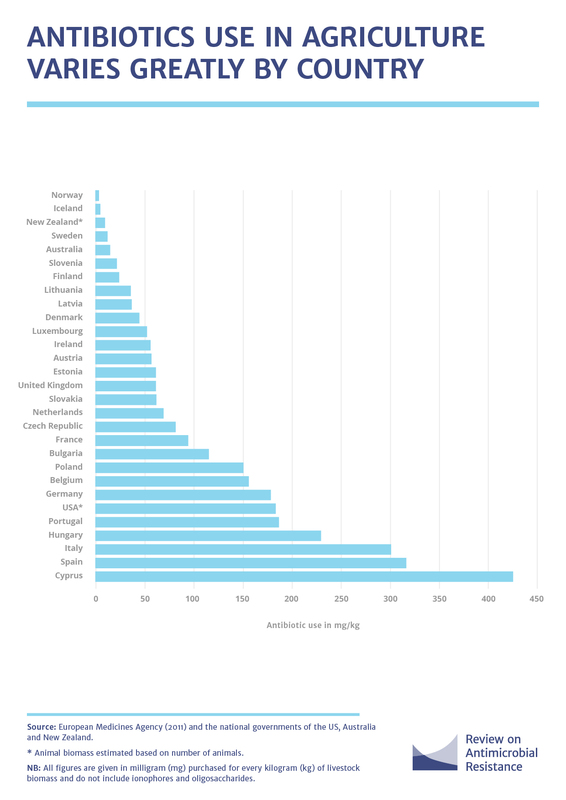 Steve Roach, of the Food Animal Concerns Trust, used a chart from the United Kingdom’s Review on Antimicrobial Resistance to show that it was possible to greatly reduce the overuse of antibiotics in livestock production. He said that the DanMap data base of antimicrobial use in animal production was possible because of the cooperation of farmers with the Danish government. Unfortunately, U.S. industry stakeholders do not support the on-farm data gathering of antimicrobial use. Mae Wu, of the Natural Resources Defense Council (NRDC), discussed the NRDC’s current petition to the FDA to restrict use of antibiotics in livestock and poultry production. The petition charges that since the beginning of FDA’s voluntary Guidance in 2011 to reduce animal antibiotic use, that use has increased. Loopholes in the scheme, which permit usage for disease prevention, allow 85-90 percent of antibiotics to be used in animal production without restriction. NRDC is working on shareholder resolutions to present at the annual meetings of agribusiness and food processing corporations. Jean Halloran, of CU, said it began to work on AMR in 1978. Although CU continues to participate in the FDA AMR policy comment process, it decided, with CFS, and TACD non-members such as NRDC and Friends of the Earth, to pressure corporations directly to help reduce AMR. The coalition rates 25 U.S. restaurant chains on whether they source their meat and poultry from companies that raise livestock without use of antibiotics. The campaign’s second report, the Chain Reaction Scorecard, released in September 2016, reported AMR related improvements in sourcing chicken supply for several chains, but that “very little progress has been made in beef or pork.” Two chains, Panera and Subway, received an “A” while 16 received an “F.” A third report is in preparation. Joint action by United Nations agencies, particularly the World Health Organization and the Food and Agriculture Organization, will be indispensable to support national action plans to reduce AMR. Dr. Reshma Ramachandran, of Johns Hopkins University and the global network, ReAct: Action on Antibiotic Resistance, summarized the work to follow up the United Nations High Level meeting on AMR on September 21, 2016. The UN General Assembly Political Declaration for that meeting called for, but did not commit to, providing the necessary financial and technical resources to implement the Global Action Plan on Antimicrobial Resistance approved by the World Health Assembly in May 2015, part of a Tri-Partite Collaboration agreed with FAO and the World Animal Health Organization. President Donald Trump’s plan to cut U.S. financial contributions to international organizations by 40 percent, including to United Nations agencies, if implemented, will leave them less able to respond to international emergencies. If AMR reduction is currently in the Urgent Care room, U.S. withdrawal from global public and animal health initiatives might well enable AMR to migrate to an Emergency Room that will not spare America First.